The association between vision and diabetes is not too well-known, but it’s definitely one to be aware of. Diabetes is a disease primarily caused by insulin resistance, of course, but along with blood sugar problems, diabetes can also affect the retinas of the eyes. Diabetic retinopathy, as the condition is called, is the most common reason for blindness in American adults. The disease starts by attacking the light-sensitive tissues in the back of your eyes. Blood vessels inside the retinas become inflamed and start leaking fluid. This is one scenario. Another type of retinopathy involves abnormal blood vessels growing exactly where they shouldn’t be: on the surface of the retina. The disease may creep in slowly, but eventually it starts to cause vision loss. Unfortunately, the condition targets both eyes at once. At first, the blood vessels in your retina are starved of their blood supply. When your retina sends signals for your body to grow replacement blood vessels, the new ones are weaker and often abnormal. Obviously, this eye disease is a huge concern for many diabetics. The good health news in all of this is that researchers have discovered that a breakfast beverage—green tea—could play a significant role in helping to prevent retinopathy. 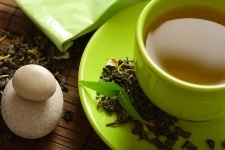 Green tea is a rich source of the polyphenol epigallocatechin gallate, or EGCG. When tested in rats, green tea protected the retina from glutamate toxicity. Glutamate is a neurotransmitter that can damage and destroy nerve cells by over-stimulating them. It was the antioxidants in green tea, including EGCG, which triggered this protective effect. You can also protect your eyesight by eating lots of healing foods that contain two substances called lutein and zeaxanthin. These two carotenoids are found in abundance in fruits and vegetables. Silva, K.C., et al., “Green tea is neuroprotective in diabetic retinopathy,” Invest Ophthalmol Vis Sci. February 15, 2013; 54(2): 1,325-36.